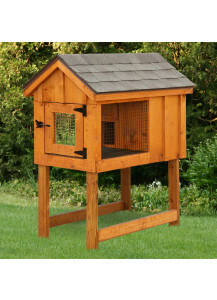 Single Duratemp Rabbit Hutch measures 24" wide by 48" deep. Standard features include a rear box door, vinyl coated wire, door on run area, silver tech roof sheathing, lifetime architectural shingles and paint. Each rabbit hutch is hand-crafted in the United States by expert Amish woodworkers and finished to order with your choice of siding color, trim color, and roof shingle color. 2' x 4' Duratemp Single Rabbit Hutch with White walls, Black trim, Charcoal Asphalt Shingles, Rear Box Door, Insulated Ceiling, Vinyl Coated Wire, and a Door on Run Area. Handcrafted in the United States By Expert Amish Woodworkers. Take this home for only $26.93 with a 36-month rental agreement from BLI Rent To Own. Your initial payment of $26.93 includes a security deposit of 10.59 and your first month's rental payment of $16.34. Ask about 90 days same as cash! Fully assembled and ready for delivery from our Red Hook, NY location. Stock Number G023384. 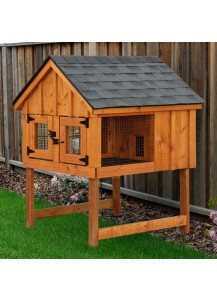 2' x 4' Duratemp Single Rabbit Hutch with Buckskin walls, Chestnut Trim, Walnut Brown Asphalt Shingles, Rear Box Door, Insulated Ceiling, Vinyl Coated Wire, and a Door on Run Area. Handcrafted in the United States by Expert Amish Woodworkers. Fully assembled and ready for delivery from our Red Hook, NY location. Stock Number G023379. 2' x 4' Duratemp Single Rabbit Hutch with White walls, Black trim, and Charcoal Asphalt Shingles, Rear Box Door, Insulated Ceiling, Vinyl Coated Wire, and a Door on Run Area. Handcrafted in the United States by Expert Amish Woodworkers. Fully assembled and ready for delivery from our Red Hook, NY location. Stock Number G023377. 2' x 4' Board & Batten Single Rabbit Hutch with Natural board and batten walls, Cedar Asphalt Shingles, Rear Box Door, Insulated Ceiling, Vinyl Coated Wire, and Door on Run Area. Handcrafted in the United States by Expert Amish Woodworkers. 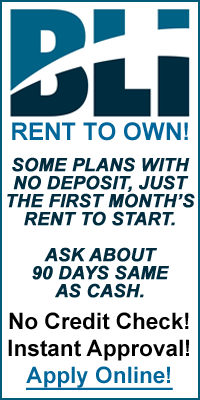 Take this home for only $39.14 with a 36-month rental agreement from BLI Rent To Own. Your initial payment of $39.14 includes a security deposit of 15.39 and your first month's rental payment of $23.75. Ask about 90 days same as cash! Fully assembled and ready for delivery from our Red Hook, NY location. Stock Number G023391. 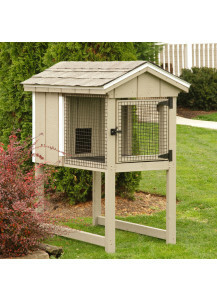 Single Board and Batten Rabbit Hutch measures 24" wide by 48" deep. Standard features include a rear box door, vinyl coated wire, door on run area, silver tech roof sheathing, lifetime architectural shingles and paint. 2' x 4' Duratemp Single Rabbit Hutch with Navajo White walls, Buckskin Trim, Weathered Gray Asphalt Shingles, Rear Box Door, Insulated Ceiling, Vinyl Coated Wire, and a Door on Run Area. Handcrafted in the United States by Expert Amish Woodworkers. Fully assembled and ready for delivery from our Red Hook, NY location. Stock Number G023378. Double Duratemp Rabbit Hutch measures 48" wide by 48" deep. This double hutch features two rear entry doors and a solid divisional wall in the cabin area. The run area has a wooden frame with vinyl coated wire attached to act as a separation wall. Both walls are specially designed for easy removal to allow the rabbits to mingle. Standard features include a rear box door, vinyl coated wire, door on run area, silver tech roof sheathing, lifetime architectural shingles and paint. 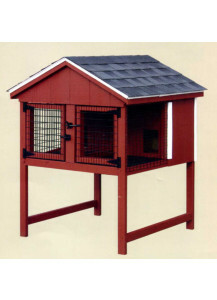 4' x 4' Duratemp Double Rabbit Hutch with Light Gray walls, Red Trim, Charcoal Asphalt Shingles, Rear Box Door, Insulated Ceiling, Vinyl Coated Wire, and a Door on Run Area. Handcrafted in the United States by Expert Amish Woodworkers. Take this home for only $41.20 with a 36-month rental agreement from BLI Rent To Own. Your initial payment of $41.20 includes a security deposit of 16.20 and your first month's rental payment of $25.00. Ask about 90 days same as cash! Fully assembled and ready for delivery from our Red Hook, NY location. Stock Number G043387. Double Board and Batten Rabbit Hutch measures 48" wide by 48" deep. This double hutch features two rear entry doors and a solid divisional wall in the cabin area. The run area has a wooden frame with vinyl coated wire attached to act as a separation wall. Both walls are specially designed for easy removal to allow the rabbits to mingle. Standard features include a rear box door, vinyl coated wire, door on run area, silver tech roof sheathing, lifetime architectural shingles and paint.